I have always appreciated the finer things in life. Like carbs. So you can imagine, I go absolutely nuts over just about any kind of fresh baked bread product. These bagels are no exception. I'm going give you the basic recipe for plain bagels, just keep in mind that to this recipe you can add any extra ingredients you like (raisins, cinnamon, fruits-I recommend using dried or at least well drained fruits, cinnamon-sugar, sesame seeds, poppy seeds...really the list is endless). For boiling the bagels prior to baking you will also need another 1-2 Tablespoons of sugar to add to the water. If adding toppings, an egg wash makes things stick much better. I generally mix one whole egg with about a tablespoon of water and beat it together well. You may also use this if you like a really golden and shiny top crust on your bagels. Now, on to the bagels! I start by adding all of my dry ingredients (yes, even the yeast) into the bowl of a stand mixer with a dough hook attachment. Mix these together on low, and while the hook is still moving start to slowly add the water. This makes a fairly wet dough as far as breads go. Once you have all of the hot water incorporated, I usually let the dough hook go a little to work up some tasty gluten in my dough before I set it to rise. About 30 seconds on high speed seems to do the trick. Then, just place your dough into a large, greased bowl and cover it with plastic wrap and/or a clean tea towel to rise for about 1 hour. The dough should double in size. Prepare your water for boiling around that one hour mark. I add about 2 Tablespoons of sugar to 6 quarts of water and bring it to a full rolling boil. As soon as I get my water on the stove I start to separate my dough and shape my bagels. Turn your dough out onto a lightly floured surface. As I mentioned, this makes a pretty wet dough, but you will not need to add a lot of flour. You will separate your dough in to 10 pieces (or more if you want to make mini bagels) and roll the dough into "snakes" about 8 inches long and 1 inch thick. Then, loop the dough around your hand (I like a small hole in the middle rather than a large one so I only use 3 fingers to wrap my dough around. Gently roll the ends together to close your circle (the dough being wet really helps with this, but you can always bad some water on the ends like glue to help them stick if you need to). Once all of your bagels are shaped allow them to rise an additional 10 minutes. I generally place mine on a bed of cornmeal so they don't stick to the surface and lose their shape/deflate when I pick them up to go in the boiling water. Boil each bagel for about 1 minute, 2 to 3 at a time, turning each one about halfway through. Remove them from the water with a slotted spoon and place on a clean towel to remove extra moisture. *If you are adding toppings, now is the time to do so. Brush each bagel with your egg wash and sprinkle with toppings. Once all of your bagels have been boiled, place them on a greased baking sheet (or line it with parchment paper) and bake them for 20 minutes on the first side, then flip and bake another 10 minutes on the other side. This will get a nice golden color on both the top and bottom of your bagels. The best thing about this recipe is that it can be adapted to anyone's taste. 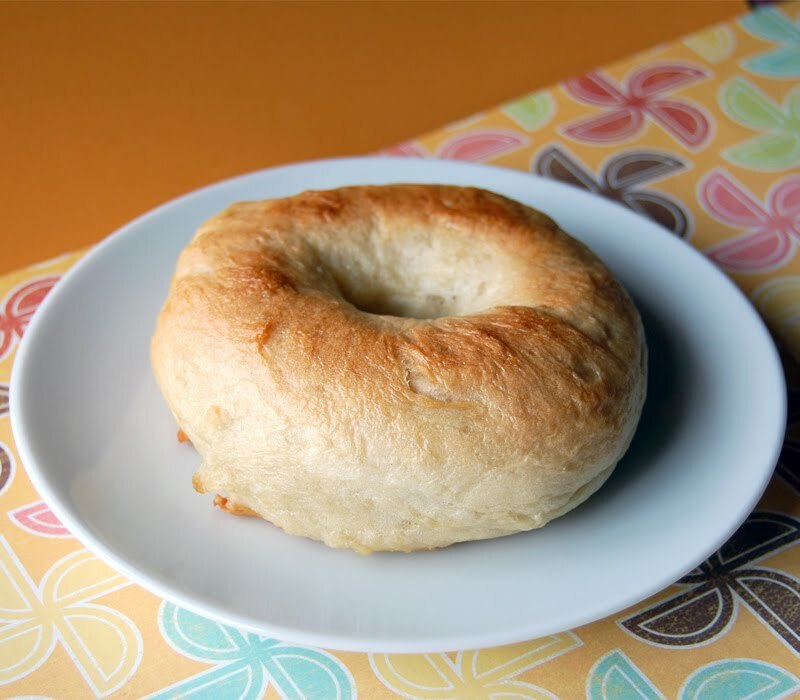 What is your favorite bagel combination? *Want more pictures to follow? Serious Eats has a very similar recipe with step by step photos. Is it possible to do this without a mixer? I dont have one and I dont mind the extra work with my hands........ but would I need to change anything? You should be able to follow the same recipe, just be aware that the dough is really going to stick to your hands if you mix by hand, or to the spoon if you use a spoon. We're talking dough club hands. I would suggest using your hands, and putting a good amount of vegetable oil on your hands to avoid some of the sticking.